Depending on which online poker site you choose to play, there will often be a variety of online poker games offered to you. The more modest poker sites may only provide three variations of Texas Hold´em Poker (No Limit/Pot Limit/Flop Limit), but the larger online poker sites and poker networks extend their portfolio of online poker games to satisfy the most demanding players´ tastes. The larger sites and networks also offer their selection of online poker games as a choice of cash games, single table or multi table tournaments, and “Sit ´n´ Go” tournaments. Some online poker games will be played at turbo pace, while others invite players to mull over their betting decisions with deep stacks of chips and long levels. Some of these online poker games are often ignored by regular poker players, as they are perceived as “secondary offerings”. However, many have a rich history, and indeed were more popular than Texas Hold´em prior to Chris Moneymaker winning the World Series of Poker in 2003. Had it not been for the coincidence of the “Moneymaker Effect” at the same time as the introduction of televised poker, we might all be playing Snap! Texas Hold´em is the most popular variant of poker game, both online and live. Simple to learn, but virtually impossible to master, Texas Hold´em has been likened to chess for the variety of strategies that can be used. Success in the game has little to do with luck and is often related to how well a player can “read” their opponent. Find out more, by reading our page about Texas Hold´em Poker. 7 Card Stud Poker was the most popular poker format prior to the emergence of “Hold´em”. It developed (in the States) during the American Civil War and was almost exclusively the game of choice played in casinos and home games until the 1970´s. It remains a popular online poker game for players with a keen sense of observation. Go to our 7 Card Stud Poker page to find out more or to see our list of 7 card stud poker sites. 5 Card Stud Poker is similar to its “big brother” in betting format and in hand hierarchy. Only one card (the first) is dealt face down, so players playing online 5 card stud poker will have the opportunity to see more of the “open” cards and be able to determine how they influence their hands and the hands of their opponents. 7 Card Stud Hi Lo is known by a variety of names and is played in the same way as 7 card stud poker except that the lowest hand shares the pot- provided it is completed with five separate cards ranked 8 or under. Ace can be Hi or Lo in this version of stud, and the variant is one of the more popular online poker games among new players because of its lower element of risk. 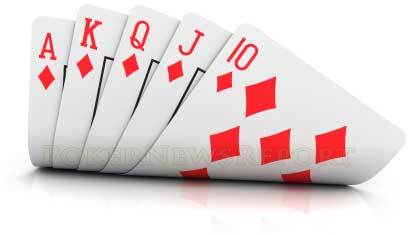 Razz Poker is another popular version of 7 card stud poker in which only the lowest hand wins. Online poker games of Razz Poker ignore straights and flushes when calculating who has the best hand, so A,2,3,4,5 is the ultimate hand to make, irrespective of suit. Razz also owes its position as the most popular format of lowball poker to television – being the first WSOP side event to be televised in 2004. Learn more about Razz Poker. Omaha Poker (or Omaha Holdem) is very closely associated to its Texan relative. The major difference is that four hole cards are dealt to each player, rather than two, and the winning hand is created by combining two of the hole cards with three of the five community cards. It may sound complicated, but many players prefer this online poker game due to the number of hand combinations which are still alive at later stages of each hand. If you want to find out more or want to know which are the best Omaha poker sites check our Omaha Poker page. Omaha Hi Lo Poker offers a split pot option for the “best” low hand. Similar to 7 Card Stud Hi Lo, straights and flushes are ignored when reckoning which hand(s) qualifies as the best low hand, although a good flush or straight might also win the “Hi” pot as well. Omaha Hi Lo Poker is best played on a full ring table, as competing against one or two other players in an online poker game where the pot is frequently split will only make the house rich! Check our Omaha Hi Lo Poker page for more information and where to play Omaha Hi Lo Poker online. HORSE Poker is the most popular form of mixed online poker games and is an acronym of the order in which the games are played – Hold´em/Omaha/Razz/Stud/Eight (The “Eight” being 7 Card Stud Hi Lo – Eights or better). There are many different types of mixed online poker games, some being simply where different betting structures within the same game are applied as the levels increase. You can find full details on HORSE Poker. 5 Card Draw Poker is one of the simplest forms of online poker to learn. Five cards are dealt face down to each player and one change of cards is allowed to enable players to improve of the hand they have been dealt. A round of betting either side of the change (“draw”) can generate a substantial pot by showdown in this game in which both skill and luck play an important part. 2-7 Triple Draw Poker is one of the new kids on the online poker games block, but is rapidly gaining popularity due to its inclusion as a bracelet event in the World Series of Poker and as it forms the first leg in many 8-game mixed poker games. In this “lowball” game, players have to make the lowest hand, but unlike Stud, Omaha and Razz, an Ace is high and straights, flushes and pairs all count as made hands. The best hand to make in 2-7 Triple Draw Poker is 2,4,5,6,7, and you have three changes (“draws”) in which to get your hand as close to that as possible. It is often worth exploring different online poker games, as you may find you have personal strengths in one format of game that you may not previously have been aware of. Whereas many first time visitors to online poker sites will automatically head to the Texas Hold´em tables because that is where their peers are playing, learning how to master alternative online poker games may well be a lucrative option.